All you need to know about Greek Baklavas No ratings yet. Greek Baklavas is a delicious traditional dessert made of layers of crispy golden brown phyllo, filled with chopped nuts and bathed into scented honey syrup! It is pronounced Mpah-klah-VHAS with an S at the end of the word (and not baklava – BAH-klah-vah)), as it is known in other countries. Reading about baklavas in various sites, you can see that there is a dispute as to the origin of this dessert. The Turks, the Arabs, the Jews, the Armenians and the Bulgarians are some of those who introduce baklavas as their national dessert. The fact is that this dessert existed during the Byzantine era, long before the Ottomans conquerred Constantinople. The Ottoman empire expanded and consequently, the dessert was introduced to the rest of the countries they conquerred. This traditional dessert has its roots in Ancient Greece, where they made a similar dessert called “gastrin” or “koptoplakous” , which is quite similar to contemporary baklavas. The word “koptoplakous”, derives from the Greek term plakous (Ancient Greek: πλακοῦς, gen. πλακοῦντος – plakountos, from πλακόεις – plakoeis, “flat”) for thin or layered flat breads. The contemporary word is “pita”, which again means flat and today is synonymous to any Greek pie. The Romans learned to make plakous from the Greeks, which they called placenta. The Cretan dessert Gastrin is mentioned in the literary work “Deipnosofistae”, Volume 4, by Athenaeus, in the 3rd century AD. ..ἐν Κρήτῃ δέ, φησίν, πλακουντάριον ποιοῦσιν, ὅπερ ὀνομάζουσι γάστριν. γίνεται δέ οὕτως· κάρυα Θάσια καί Ποντικά καί ἀμύγδαλα, ἔτι δέ μήκων, ἃ φρύξας θεράπευσον καλῶς καί εἰς θυίαν καθαρά τρῖψον ἐπιμελῶς· συμμίξας τε τήν ὀπώραν μάλαξον μέλιτι ἡψημένῳ, προσβαλών πέπερι πλέον καί μάλαξον· γίνεται δέ μέλαν διά τήν μήκωνα. διαπλατύνας ποίησον τεράγωνον· εἶτα σήσαμον λευκόν τρίψας μάλαξον μέλιτι ἡψημένῳ καί ἕλκυσον λαγάνια δύο καί ἓν θές ὑποκάτω καί τό ἄλλο ἐπάνω, ἵνα τό μέλαν εἰς μέσον γένηται, εὖ ῥύθμισόν τε αὐτό. ταῦτα καό ὁ σοφός πεμματολόγος Χρύσιππος. On Crete, he says (referring to Chrysippus), they produce a small cake they call a gastrin. It is made as follows: Use some Thasian nuts (walnuts), Pontic nuts (hazelnuts) and almonds, along with some poppy-seeds; toast them, keeping a close eye on them as you do, and mash them fine in a clean mortar; mix the fruit in and work it smooth along with some reduced honey; add a considerable amount of pepper and work it smooth. It turns out black because of the poppy-seed. Flatten it out into a square. Next, grate white sesame-seed; work it into a paste with reduced honey; press it into two sheets, putting one on the bottom, and the other on top of it, so that the black mixture can go in the middle; and assemble it nicely. Thus the wise pastry-expert Chrysippus. (Chrysippus of Tyana was a Greek writer on gastronomy). Gastrin was sweetened with honey and petimezi (a sweetener made from grapes). The traditional Greek baklavas, is made with many layers of thin sheets of “phyllo kroustas”, which are brushed with butter, with various kinds of nuts and spices added between the layers and sweetened with honey syrup. However, even in Greece you will find different kinds of baklavas, depending on the region. The key for the most flavourful Baklava is the butter. The butter used makes a huge difference in the taste of any dessert. In Greece there are many types of butter, depending on the region. Where sheep and goat are bred, they use ewe’s and goat milk butter. Most traditional Greek desserts use this butter. This butter is delicious but has a rather strong flavour. (Images 1 and 4). Number 4, called stakovoutyro, is produced in Crete. In places they breed cows, they use cows milk butter, made with the cream of the milk. The most popular Greek butter is called “fresh butter” or “Kerkyras butter” (Corfu type). (Image 3). In Northern Greece, at Kerkini lake, they breed water buffalos. The butter produced from buffalo milk is really creamy and delicious. (Image 2). We also make Baklavas vegan during Lent, using mild extra virgin olive oil or an olive oil based margarine, instead of butter. Usually almonds or walnuts are used. The nuts used also depend on what is produced locally. For example, in Central Greece and other places where almond trees are cultivated, baklavas is made with almonds. In regions with high altitude, where walnuts are cultivated, it is made with walnuts. The pistachios originally started being cultivated in Aegina island, around the mid 19th century. Now it is cultivated in many other places as well. However, the pistachio nuts are quite expensive and most of its production is exported. In such places where it is cultivated, most of the traditional desserts, including baklavas, are made with pistachios. However, you can use whatever nuts you prefer or a mixture of various nuts. Cinnamon and cloves are the most common spices used in Greek desserts. Other countries use nutmeg, cardamon, etc. Honey was one of the sweeteners used since antiquity. The others being petimezi made from grape must and charoupomelo, the syrup produced from carobs. Sugar began being produced in Greece many centuries later. Honey is relatively expensive, so the syrup can be made with only honey, only sugar or a mixture of sugar and honey. When the syrup is added to any desserts such as baklavas, the syrup may crystalize again. In order to prevent this from happening, you can add either a couple tablespoons lemon juice or glycose syrup. I usually prefer lemon juice to glucose but in this recipe I did not want the baklavas to have a lemony taste, so I chose glucose. Make the syrup first so that it cools completety. It is best to pour the cold syrup immediately after the dessert is baked. Always laddle really slowly the syrup over the hot Baklava, enabling each ladle to be absorbed, so that the syrup is absorbed evenly. This is also done gradually so that the top phyllos do not break while pouring all the syrup at once. Do not hurry to serve the dessert as it will need at least 4 – 5 hours to absorb all the syrup. It is even better to serve it the following day. After many experiments I will give you below some of my tips to make this no-fail delicious dessert. The taste of ewe’s and goat milk butter is a bit strong for my taste, so I use both cow’s and ewe’s milk butter. First of all I clarify the cows’ milk butter and while it is still hot I mix in the ewe’s and goat milk butter. There are many types of phyllo pastry in Greece but the most common one used is called phyllo kroustas. You can find it fresh in all supermarkets. If you use frozen phyllo, it is best to thaw it in the fridge from the previous day. Phyllo dries out quickly. It is advisable to keep the phyllo covered with a clean tea towel or cling film. No wet tea towel is necessary. A package of phyllo usually has 12 – 15 sheets. I usually use 15+ but you can add more if you like. The baking tray I use, is about half the size of the phyllo sheets. I use the baking tray upside down, to trace and cut the phyllo, so that it is a couple of centimetres wider than the base of the baking tin. I use half of the package, which I cut in the middle. After cutting the phyllos, there is a leftover stripe on top, about 4 – 5 centimetres wide. Do not discard these pieces. Brush them with butter and use them somewhere in the middle as another layer. Brush the phyllos separately on your counter and then put them in the baking tin. Alternatively, if you put the phyllo dry in the baking tin, use the brush to sprinkle the butter on top. Do not brush it when you put it in the baking tin, as the phyllo should remain airy inside, so that it cooks all way through. When all the layers of baklavas are added, use a sharp knife to cut the pieces. Never bake baklavas without cutting the phyllos first, as later on they will crumble. Some people add half the amount of phyllo, all the nuts in the middle and the remaining phyllos on top. The end result is not so pretty. After bushing the baking tin, I add 4 – 5 sheets of phyllo as the bottom layer and then depending on how many phyllos I will eventually use, I distribute the nuts, adding two sheets of phyllo after each addition of nuts. The last layer is again 4 sheets of phyllo. Add a clove in each piece. This is mostly done for decoration but it also adds some flavour as well. This is later on discarded when eating the dessert. Finally, spray with water or wet your hands and sprinkle some drops of water on top. This will help keep the phyllo in place as the circulating heat ends up skimming over the top layer of phyllo. 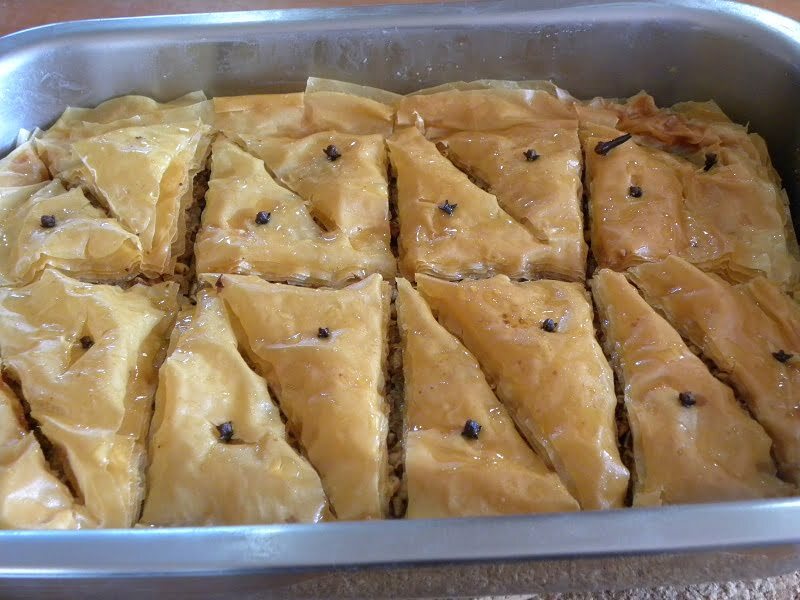 Bake baklavas on low temperature: 150oC / 300˚F is the preferable temperature as a higher temperature will brown the top sheets quickly and the remaining inside will not be crispy. Baklavas should not be refrigerated, as the phyllos will absorb moisture. Store at room temperature covered with a tea towel up to a week or more. In a medium saucepan, combine sugar, honey, glucose, cinnamon stick, cloves and water. Mix to dissolve sugar and honey. Bring to a boil over med/high heat, stirring until sugar is dissolved, then reduce heat to med/low and boil additional 5 minutes without stirring. Remove from heat. Remove from the heat. If using frozen phyllo, thaw phyllo from the previous night in the fridge. Trim phyllo dough to fit your baking dish. Each packet has 12 - 15 sheets of phyllo sheets. Any leftover pieces can be used as middle layers. Melt the butter. Start with the cows’ milk butter and clarify it. Mix in the ewes’ milk butter. Butter the bottom and sides of a 32 x 23 x 6 cm (12.5 x 9 x 2.5 inches) baking pan. Preheat the oven to 150oC / 300˚F. Pulse walnuts in a food processor until coarsely ground. In a medium bowl, stir the chopped walnuts and mix in the cinnamon, cloves and semolina or dried breadcrumbs. Place 4 - 5 phyllo sheets into baking pan one at a time, brushing each sheet with butter. (During summer, keep remaining phyllo covered with a tea towel). Spread about 1/5 of nut mixture over the phyllo dough. Add 2 buttered sheets of phyllo, then another layer of nuts. Repeat x 4 times. Finish off with the remaining layers of buttered phyllo sheets. Sprinkle any leftover butter on top. Finally spray or sprinkle a few drops of water on top. With a very sharp knife, cut the pastry horizontally into 2 long stripes then into 4 vertical stripes and finally cut each piece into two triangles. Add a clove in the middle of each piece of baklavas. Bake for 1 hour and 30 minutes or until tops are golden brown. Remove from the oven and immediately ladle or spoon cooled syrup evenly over the hot baklavas, (you'll hear it sizzle). This will ensure that it stays crisp rather than soggy. Let baklava cool completely, uncovered and at room temperature. For best results, let baklava sit 4-6 hours or overnight at room temperature for the syrup to penetrate and soften the layers. Store at room temperature, covered with a tea towel for 1 to 2 weeks.